Is this déjà vu all over again? Have been told that on orders from the Japanese government, the Okinawan police guarding the Henoko base in Okinawa have been replaced by a contingent of Japanese guards from mainland Japan. The governor of Okinawa, Takeshi Onaga, has defied the Japanese government — again. It is coming to a head. Will the Japanese guards from mainland Japan end up shooting Okinawans protesting the building of the Henoko base like the Satsuma samurais from Kyushu who decimated the Okinawan defenders when they invaded Okinawa in 1609? Think about this. In 1945 during WWII, the Japanese military decided to use Okinawa as their stand against the American military — away from mainland Japan. What ensued was the Battle of Okinawa, the “Typhoon of Steel.” About 100,000 Okinawans, a third of the population, died. Today, the Japanese government and the American military want to have most of the American military bases (70%) in Japan concentrated on Okinawa. Do you remember back during December 1941 in Pearl Harbor when the American military commanders decided to dock all the battleships of the Pacific Fleet lined up in a row – “Battle Ship Row” — because it made them easier to guard? Seems to me that putting most of the American military forces on Okinawa is, well, like putting “all your eggs in one basket.” Potential annihilation all over again? Then the question comes to mind: If another country wanted to wipe out the American military on Okinawa with one strike, it would probably use a nuclear weapon. Who in today’s world is physically able and mentally crazy enough to do this? What country sits 976 miles from Okinawa with a dictator who has nuclear weapons and missiles at his disposal and no diplomatic relations with the United States? Think he could and would do it? Now, think. If that ever happens, would Okinawa island be destroyed and all of the Okinawan people in Okinawa killed? Finally, imagine that the Okinawans in Okinawa are going about their daily lives with this hanging over their heads. 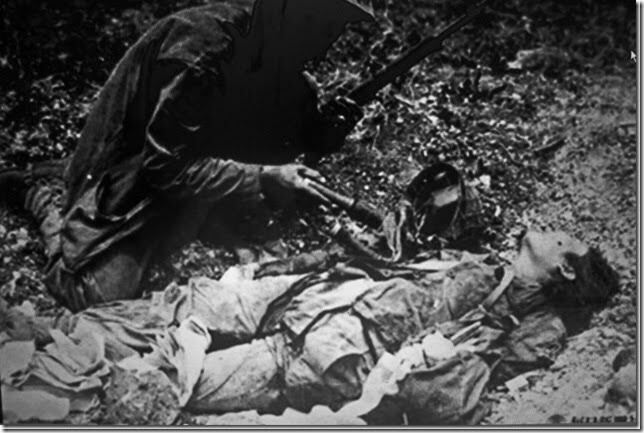 Do you know and remember that, during the Battle of Okinawa, the Japanese military instructed and encouraged the Okinawan people to kill themselves rather than be captured by the Americans? 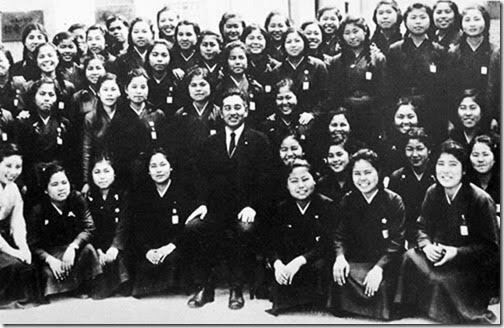 Do you remember the Himeyuri nurses, 222 young girls from the top schools between the ages of 15 and 19, who were hastily made into nurses to support the Japanese army on Okinawa? After the Battle of Okinawa was over, 136 of those young nurses were died. Here’s a photo of some of them. Kinda hits home doesn’t it? Perhaps they look like your daughter, sister, cousin or friend? Himeyuri nurses: 222 young girls from the top schools between the ages of 15 and 19 were hastily made into nurses to support the Japanese army in the Battle of Okinawa. What brought my attention to the Himeyuri nurses some years ago was the picture below, which I saw in the Peace Museum in Okinawa. It was a young nurse who was killed by the Marine kneeling over her and holding a grenade that he found in her possession. The picture implies that the Marine was justified in killing her because of the grenade. What wasn’t said was that the grenade was given to her by the Japanese army to kill herself to avoid being captured by the Americans. This young nurse was killed by the Marine kneeling over her and holding a grenade that he found in her possession. So let me ask you, considering the fact that 100,000 Okinawans died during the Battle of Okinawa, what is the difference between what the Japanese government was thinking back in 1945 and today? Does the government think that Okinawa and the Okinawan people are expendable, as it did back in 1945? What is Japan’s PM Shinzo Abe thinking? Why does he not listen to what the Okinawan people are saying and pleading? Perhaps he believes that they don’t count? Here is a video that articulates well the issue of the current protest at Henoko, Okinawa, and the opposition to American forces in Okinawa in general. These are my thoughts, and who am I? I am a Vietnam veteran who volunteered. Back 1968, I believed it was the right thing to do. I still do. I penned the above because it’s hard to sit back and see the island of my ancestors being ignored and treated badly by my country, the United States, and by Japan. It is the right thing for me to do. I submit to you that if you cut me and see the blood that runs in my veins, you will see that it is red, white, and blue. If you dip your finger in it and taste, you will taste the spirit of Okinawa. As we leave for Okinawa, we would like to pass on this message to anyone who may be interested. I was going to send out one of my own, but Young Okinawans beat us to it since we have been so busy getting ready for our annual Gakumun Tour to Okinawa. I hope that you have time to read and look at the links forwarded below. In shimakutuba class today we talked about how the Okinawa way of introducing one’s self does not begin with your own name, but with your ancestral origins and ancestors. Also, when referring to Okinawa, it is the Okinawa way to say “Watta Nmarijima”, or “Our Birthplace” even though you weren’t born there. The reason is because we are included with our ancestors, as will be the future generations, to the native islands of Okinawa. If you think about this, this makes it culturally and ethnically important for us to at least take the responsibility to listen to the voice of our friends and family bace “home” in Okinawa. Once again, just as Okinawa was devastated after the war, they are crying out for help. It is not about the base anymore. More importantly its about Okinawa’s democracy being trampled on and which will affect our culture, language and history. They are trying so hard to save the pristine coral reefs that are home to one of a kind sea life, and which supplies the local people with food. We have gone to Henoko to visit with the local elders and have heard their stories of their experiences during the war and the reasons why they want to save their beautiful bay and sacred places. They are willing to die for this and they said they already have gone through the war so they will fight for peace….for their grandchildren. Governor Onaga of Okinawa and the people are calling for help. Please take some time to at least catch up on what is happening in our ‘nmarijima”. I hope all is well. I just wanted to pass on the below event going on this week Wednesday for anyone who may be interested. See below for the flyer. As a Okinawan club/ native, I think it’s very important for us to at least take the time to understand a major issue going on in Okinawa regarding the base relocation at Henoko (in Okinawa). This is not something we should simply ignore as some of our families / friends in Okinawa struggle to have their voices heard and recently the conflicts/ enforcement have been getting more physical. It saddens me to see pictures and videos of Senior Citizens 80+ being pulled away for standing up for their right. 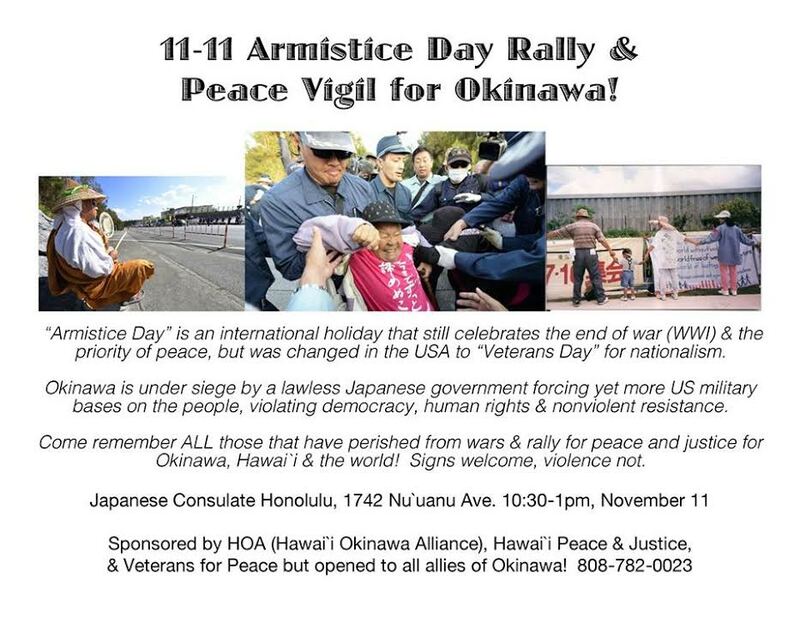 There are misconceptions that Okinawans are against US and/or military bases and this is simply not the case. It comes down to unfair treatment of Okinawans, Okinawans wish for peace, and the environmental impact. Here’s a good recent article/ editorial published by the NY Times shared by one of our member.